Ah, you’ve had a fender-bender. Does your bumper need replaced or simply repaired? And don’t procrastinate–the longer a repair goes untended the more expensive it gets. Car bumper repair is an extremely common body shop repair. Many bumper repair jobs can be saved with reconditioning techniques which can cost significantly less than replacing. A lot depends upon the severity. 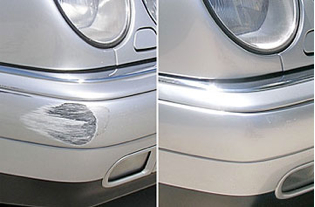 Fine scratches can easily be repaired with a scratch remover kit which is a very affordable option. These products are rubbed into the paint or plastic of the bumper to distort the surrounding area and fill in the scratch. Make sure though that the scratch remover kit is of the highest quality–your bumper will look better. A more deeply scratched bumper might require body putter. Once in place, the putty can be painted to match the existing paint color. Again, require that your body repair shop use high quality putty and paint to restore your bumper to a like-new condition. Dents, a step up from scratches, can also be repaired with judiciously applied putty and paint. More serious dents or other damage may require a replacement. Having said that, an experienced body shop can often avoid a costly replacement. At Wilde Bodyworx our professional and highly trained technicians can restore your bumper to pre-accident condition by using the finest paint products and materials in the industry. Even if your plastic bumper was damaged from a scuff, puncture, scrape, hole, tear, crack or scratch, our expert technicians can often repair your bumper without replacing it.